The fire-damaged Massachusetts State Police Museum and Learning Center. A three-alarm fire that damaged the State Police Museum & Learning Center in Grafton this weekend broke out spontaneously when rags and sawdust tossed together in a plastic bag heated up and ignited, the state fire marshal said Monday. Workers were refinishing wooden molding in the museum on Saturday and as they completed their work for the day they put rags with stain on them into plastic trash bags along with sawdust accumulated during the project, officials said. Over the next few hours, the rags began to dry out, producing heat that ignited the sawdust, State Fire Marshal Peter. J. Ostroskey said in a statement. The fire, caused by the “spontaneous combustion of oily rags,” was discovered around 9:30 p.m. Saturday, officials said. The museum, a former State Police barracks, did not have fire suppression sprinklers installed, Ostroskey said. 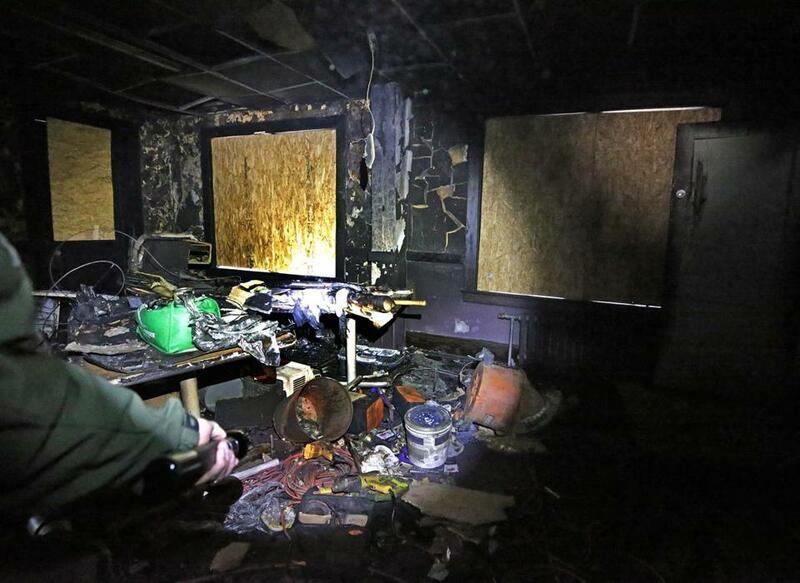 The blaze was concentrated in the second floor meeting room where the restoration work was underway, officials said. The museum’s exhibits and galleries, which are on the first floor of the building, sustained only smoke and water damage, State Police said this weekend. State Police Colonel Richard D. McKeon, in a statement, applauded the response by Grafton firefighters whose work saved historic artifacts tracing the long history of the only statewide police agency. Grafton Fire Chief Michael Gauthier said firefighters deployed “salvage covers’’ as they battled the fire to protect the museum’s collection. First, hang them outside to dry in a safe area or spread them out flat, making sure they are weighted down outdoors. They should not be in a pile. Second,the rags should be stored in a non-flammable container, such as a metal paint can, covered by a solution of water and a detergent that breaks down oil. The can must have a tight fitting cover. The material should then be disposed of during the municipal sponsored hazardous waste collection programs.